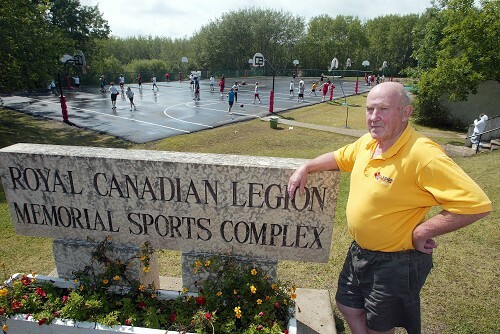 Manitoba Sports Hall of Fame members comments pertaining to former Legion Athletic Camp Head Coach and Founder George Phillips who in 2011 has shifted his interest to the devlopment of senior adult sport research and training. former Head Coach George Phillips passed away in 2015. "I believe that his greatest legacy lies in the hundreds of men and women, who after their own athlete careers ended, give back to the young people of Manitoba as coaches, teachers and volunteers," Bruce Pirnie, track and field (inducted 1987). "Since the early 1960s', he has been one of the greatest builders of many sports in our province. He is generally considered to as The Father of the internationally famous Legion Athletic Camp at the International Peace Gardens. He has always dared to be different, unconventional and innovative," Brian Marshall media. Organized the inaugural Royal Canadian Legion Athletic Camp located at the International Peace Gardens. The 1962 edition was a two-week summer camp (40 males first week, 40 females second week) with four of Manitoba's best track coaches. Nearly 35,000 amateur school-aged athletes have attended the annual summer camp, which has gained international acclaim with athletes from around the globe attending. In the 1970's he received a plague for his involvement in amateur sport from the Governor General of Canada. Organized mobile track and field clinic during the summer months, which traveled trough out he province of Manitoba. Funded by the Royal Canadian Legion. One of the key organizers and meet director for the highly successful Red River Relays indoor track meet held annually at Winnipeg Arena. Physical education instructor at various schools including Churchill High School and General Wolfe. Coached numerous championship teams in various sports. Assistant director of physical education for Winnipeg School District #1. Principal at Hugh John MacDonald and Kelvin High School. Recipient of the inaugural Manitoba High Schools Athletic Association Certificate of Recognition in 1980. One of the first summer sport camps to go co-ed. One of the first summer sport camps to have females in head coaching roles. One of the first summer sport camps to delve into sports medicine. One of the first summer sport camps to offer multi sports. Camp founder and head coach George Phillips talking to Royal Canadian Legion members during a Colour Party in the summer of 2003.